Fight For New Jersey Fiduciary Rule Yields Doomsday Rhetoric From Both Sides (Greg Iacurci, Investment News) – Earlier this fall, New Jersey announced that it intended to issue new state regulations that would apply a fiduciary duty to financial advisors in the state. And this month, the New Jersey Bureau of Securities conducted two hearings to begin its public comment process about whether or how exactly to adopt and implement a fiduciary rule. Fiduciary advocates, including renowned fiduciary researcher and law professor, Tamar Frankel, emphasized that the fiduciary duty of loyalty is, “the backbone of trust in the financial system,” and Knut Rostad of the Institute for the Fiduciary Standard suggested that it was necessary for states like New Jersey to act and shore up the gap in fiduciary regulation that would be created by the SEC’s “Fiduciary In Name Only” Regulation Best Interest proposal (and notably, the New Jersey governor had called out the SEC rule’s weakness when explaining why he felt it was necessary for the state to proceed with a fiduciary rule in the first place). On the other hand, lobbyists representing insurance sales agents under NAIFA raised concerns that a standalone New Jersey rule would create a “crisis” by putting insurance agents under differing state and Federal rules, especially as the SEC has stated its intention to proceed with its own rule in 2019. Yet, as Frankel notes, other professions (e.g., lawyers and accountants) have been able to operate under a state regulatory structure successfully. And of course, the reality is that insurance agents are already regulated at the state level in the first place, as are stated-based RIAs (though state regulation could overlap with Federal regulation of broker-dealers under FINRA). In the meantime, the final comment period for the “pre-proposal” phase for New Jersey’s fiduciary rule ends December 14th, with a formal proposal anticipated thereafter. Democrats Restructuring House Financial Services Committee (Elizabeth Festa, ThinkAdvisor) – With the shift in power in the House of Representatives after the mid-term elections, Representative Maxine Waters is anticipated to become the new chairwoman of the powerful House Financial Services Committee, and in preparing for the transition, Waters has already indicated a plan to change the current “Capital Markets, Securities, and Investment subcommittee” into a renamed “Investor Protection, Entrepreneurship, and Capital Markets” subcommittee with a particular focus on annuity and fiduciary issues. 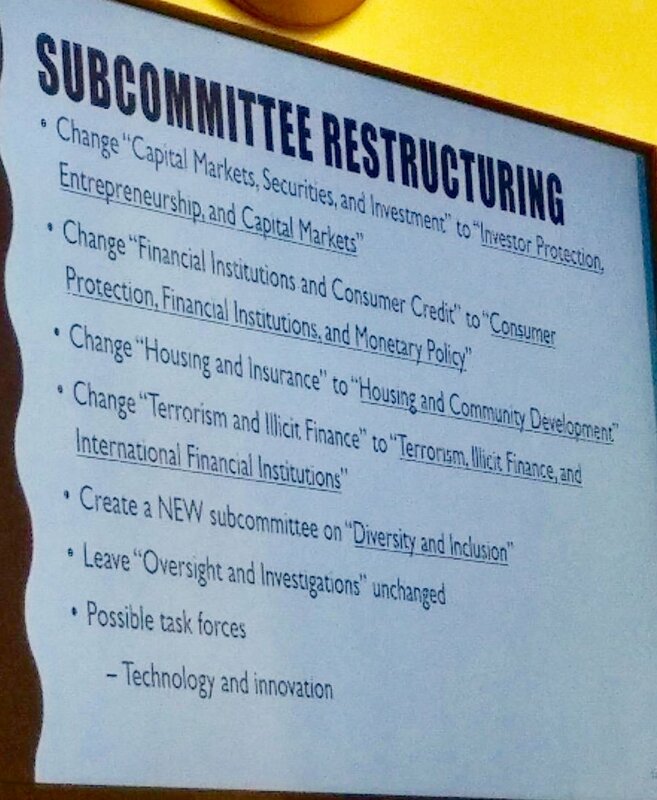 The move is significant, as the House Financial Services Committee has oversight of the SEC (along with the Federal Reserve, Treasury, FDIC, and more financially-related government agencies), just as the SEC is gearing up to issue a final version of its new Regulation Best Interest proposal in 2019… and thus raising questions about whether Congress (via the House Financial Services Committee) will put more pressure on the SEC to establish a more stringent fiduciary rule, especially since Waters was a vocal supporter of maintaining and not delaying the Department of Labor’s own fiduciary rule. One Person’s View Of The New OneFPA Network Initiative (Bob Veres, Inside Information) – Earlier this month, the Financial Planning Association announced its new OneFPA Network initiative, which the FPA states is primarily meant to help create more alignment and greater integration amongst its 86 independent chapters, through a model characterized as “Centralized Functionality with Participatory Governance,” whereby existing chapters themselves are dissolved and consolidated into the National organization… while re-creating “The New Chapters” (TNCs) that would still have local leadership and programs but centralized staffing, technology, and accounting (including pooling all assets of FPA National and its chapters into a single bank account with internal accounting earmarks for each chapter’s existing reserves), all overseen by a new “OneFPA Council” comprised of various representatives from the TNCs themselves. According to FPA’s own description of the “OneFPA Journey,” the process actually began back in 2014, when the FPA hired an outside consultant who concluded that the FPA chapter system has “operational and cultural issues impeding FPA’s growth and success.” Yet as Veres notes, the FPA arguably has the strongest chapter system of any of the associations in the financial services industry, and for most members who are engaged with the FPA in the first place, it’s the chapters where they’re (already) engaging successfully. Though ultimately, Veres suggests that the primary concern to the FPA proposal is simply that it’s filled with a lot of “buzzwords” about empowerment and member experience and elevating the FPA brand, and short on the details about what the actual changes will be… which is especially concerning given that the FPA membership is just now learning of the proposal for the first time, even as it’s already being framed as a “done deal,” with all existing FPA chapters to be dissolved by the end of 2019. Yet while the exact details in key areas are still to be determined, FPA has been clear in stating that all chapter assets will be consolidated to a single national bank account, that future chapter decisions about how to use their money will be subject to National oversight by a new “OneFPA Resource Coordination Committee,” and that future chapter sponsorship dollars may be shared with National… coinciding (perhaps not coincidentally) with the ongoing decline of the Journal of Financial Planning’s own advertising revenue and the ongoing shrinkage of the exhibit hall at FPA conferences (which may be increasingly pressuring FPA National’s own budget and resources). Ultimately, Veres suggests that the chapters may not take kindly to having National “raid the piggy banks” of its most financially successful chapters and that instead perhaps National should simply work harder at maximizing (or at least, fixing) its own existing revenue-generating resources. How To Turn Referrals Into Appointments (Kerry Johnson, Advisor Perspectives) – While most financial advisors rely on referrals for at least a significant portion of their new clientele, few have a good process for actually receiving a referral and contacting the person in the hopes of turning them into a client. The usual process is usually an outreach to the effect of, “Hi, my name is Kerry Johnson. I am a financial advisor. Tom Jones gave me your name and thought we should meet. Are you available next Tuesday?” Yet the reality is that, especially amongst affluent individuals (who would be especially good clientele), a referral to them may be an entry or access to reach them, but it’s not a reason for them to actually book an appointment with you. In fact, because referrers rarely also send a note to the person being referred to let them know the inquiry is coming (i.e., rarely does a referred lead say, “Wow, I have been expected your call!”), the first step is simply to take a pause and actually introduce yourself properly (e.g., “Hi, Mr. Jones, my name is Kerry Johnson. I am a financial advisor with Johnson Financial. We have a mutual friend, Tom Smith. You know Tom, don’t you?” Next, try to make some more personal connection – ideally, by asking the person making the referral in the first place, “How well do you know [referred person]? Can you tell me something special about them?” so you know what the connection point is (and can engage them more quickly and directly). Next, you can ask permission to move the conversation forward to talking about you (e.g., “Has Tom mentioned anything about me?” And when they answer no, ask them, “Can I give you the quick elevator speech?” which emphasizes that you’re still trying to respect their busy time). From there, you can try to offer them a quick takeaway, ideally recapping the some of the personal details and needs or concerns they’ve already articulated, back to what you can provide… and gains them commitment to only then, finally, ask for a (follow-up) meeting. A Guide For Introverted Salespeople (Matthew Pollard, Quiet Revolution) – In a world where “good” salespeople (and good leaders) are often described with words like “outgoing, charming, and charismatic,” it can be challenging for introverts to excel (or at least feel as though they have to “act more extroverted” in order to succeed). But in his new book, “The Introvert’s Edge,” author Matthew Pollard suggests that the key to success for introverts is not to try to act more extroverted, but instead to craft an effective process that can be followed instead… recognizing that, in the long run, a good process will beat “just” a good (extroverted) personality anyway. Pollard’s 5-step process includes: 1) Establish trust (by finding some way to connect with the prospect in a one-to-one conversation), and provide an agenda (as everyone likes to know where the conversation is headed, especially in a sales meeting, and even just a rough agenda often helps them to relax); 2) Ask probing questions (often a natural strength for introverts, as asking questions to find someone’s pain points is often more effective than just pushing what you want to sell anyway); 3) Be certain you’re speaking to the decision-maker (and don’t get caught in the trap of having a conversation only to end out with the response, “I can’t make this decision now. I have to speak to my [spouse/boss/investor/partner] first”); 4) Tell stories that illustrate that working with you successfully looks like (as anyone can and probably has already compared your basic features and services on your website); and 5) Answer objections with more stories (to illustrate how someone else with a similar objection ended out with a successful outcome with you). The key point, though, is that these steps to the sales process and conversation don’t actually rely on being extroverted, and in fact, some (like connecting with probing questions) are actually more suited to introverts anyway. And once you have a process for sales, you may find it even more comfortable to simply be your natural, authentic (and introverted) self! How To Stop Saying “Um”, “Ah”, and “You Know” By Embracing The Pause (Noah Zandan, Harvard Business Review) – Anytime we find ourselves rattled while speaking, whether due to nervousness, distraction, or just being at a loss for what to say next, it’s common to use “filler” or “crutch” words like um, ah, you know, right, well, or even the word “like” itself. Yet when such filler words are using too often, they can cause the audience to disengage from the message itself (as they’re distracted by excessively repeated filler words), it’s hard to get the audience to buy into the message when it can’t be stated concisely and directly (due to excessive filler words), and it can even undermine our credibility itself (as eventually, the audience perceives the heavy-filler-word speaker to be nervous, distracted, or otherwise disengaged themselves). Yet still, for many, it’s hard to let go of filler words, as most of us have been conditioned to “fill the void” when there are even brief gaps in conversation, or outright use filler words to “hold the conversational floor” as we figure out what we’re going to say next. Except as it turns out, just pausing is often far more acceptable than we realize. In part, it’s simply because our brains think faster than we talk – which means what is actually a very minor pause for the listener (anticipating the slower pace of speaking) may seem like a much longer and more awkward one for the speaker (who is thinking much faster) than it really is. And in fact, research suggests that great speakers often use pauses of at least 2-3 seconds, and up to 5 seconds can still be effective without losing credibility (whether pausing to collect your thoughts, calm your nerves, or simply build suspense in the message itself). So how do you change the behavior if you want to? The starting point is self-awareness – videotape or transcribe your own most recent talk, presentation, or conversation with a client or colleague, and listen to yourself… because once you recognize the filler words in yourself, you’ll be more cognizant of them as you’re talking as well. And once you’re aware… practice consciously pausing when you feel the urge to say them (you can even practice with yourself by recording yourself talking about your day into a recorder and then listening back to see how you did!). What If “Referral Only” Was A Strategy? (Steve Wershing, Client Driven Practice) – Most advisory firms generate at least a significant portion of their new clients from referrals, and for some firms, it’s their only source of new clients. Yet Wershing notes that in a world where most advisory firms spend little to nothing on marketing, it’s perhaps inevitable that referrals are the primary source of new business for those advisors because it’s the only thing left in the absence of any other marketing efforts! Alternatively, if an advisory firm really did want to proactively pursue a bona fide “referrals only” growth strategy, Wershing suggests that it would need to be executed with a number of key tenets: 1) have a well-defined target market that is articulated to clients, so they know exactly who to refer in the first place; 2) have a tailored process specifically for that ideal target market referral (to ensure that any appropriate clients who are referred will naturally connect to the advisor’s unique process relevant for someone just like them); 3) talk proactively to clients about how they handle referrals that fit their target market to make clients more comfortable with referring; 4) teach clients how to refer, and the way to explain how their services are unique for their specific target market where they are differentiating; 5) track referrals to know what’s actually working (and be able to articulate exactly how many referrals are coming in every week or month of the year); and 6) reward referral sources (which could be special recognition or a special level of service, rather than a purely monetary award, but do something to express gratitude for a good referral). The bottom line: for firms that want to operate as “referral only,” it still has to be treated like a bona fide targeted marketing process itself… otherwise, it’s just the default that’s left behind in the absence of failing to market at all. The Obsolete “By-Referral-Only” Policy (Paul Kingsman, Advisor Perspectives) – For some advisors, claiming they grow “by referrals only” is a way to connote an air of exclusivity, suggesting to prospects that there are only limited opportunities to actually become a client (and perhaps egging them on to “try” to become one). Yet as Kingsman notes, for most advisors, if you met a million dollar prospect you met in the proverbial (or an actual) elevator, you’d take him/her in a heartbeat… which means, simply put, that the “by referral only” language isn’t really authentic and genuine. Even worse, conveying that you grow “by referrals only” can potentially turn off prospects, as the double-edged sword of exclusivity may draw some in, but repel others away. As an attitude of growing “by referrals only” implies that you don’t just want to talk to people and help them for the sake of helping them… a potential turnoff for some, and a conversation-ender for those actually talking to a (non-referred) prospect who may simply interpret the message as meaning the advisor is unavailable, and they should look elsewhere for advice (even if they were otherwise an ideal prospect). Notably, Kingsman suggests that there’s nothing wrong with growing frequently from referrals, but there’s a difference between saying “Typically new clients come to us from referrals… and while we’re pretty particular about who we work with, we’re always happy to talk with people to see how we can help”… and if you are going to truly be a referrals-only advisor, at least have the courtesy to help those who aren’t a good fit for you get referred themselves out to another advisor who will take them (and enhancing your perceived goodwill in the process). The Value Of Prospects Who Don’t Close (John Pojeta, ThinkAdvisor) – While most advisory firms struggle with getting enough prospects, for some, the challenge is actually a steady flow of prospect opportunities… such that prospects either “close” and become clients or the firm simply moves on to the next. And in the process, may forget the importance of diligent follow-up with the original prospect. In fact, even if it doesn’t work out because the prospect decides to work with another advisor… there’s still always the possibility that the other advisor doesn’t work out, and that the prospect will eventually come back and give the advisor a second (or really, first) try. The starting point to resolve this is at least to have some kind of “drip marketing” system that keeps the advisor top-of-mind with prospects who didn’t work out (recognizing that even if they didn’t decide to come on board now, they may still come back). But Pojeta suggests that there’s a more fundamental mindset shift that’s necessary – recognizing that every prospect is an opportunity, and that while business development is a “Game Of Numbers” (with a large number of “noes” that have to happen before the “yeses” come), it’s still important to treat every prospect like an opportunity (even if it doesn’t look like they will be in the moment) and at least point them in the right direction to resources that will help them if you can’t (a kindness they may remember if/when they’re actually ready to work with you later!). How To Increase The Volume Of Your Brain And Make Optimal Decisions (Benjamin Hardy, Thrive Global) – In the early 1800s, the reigning view of leadership and success was known as the “Great Man Theory”… which effectively stated that if you don’t already have traits of being a great man, you weren’t destined to be a leader (i.e., that our traits were fixed, and you were simply born with good ones, or not). In the early 1900s, this view evolved to a “Trait Theory” that suggested the key to success wasn’t necessarily being born as a holistically “Great Man,” but was still predicated on the idea that people are born with certain qualities that will make them excel (and those who aren’t born with them simply won’t). And in recent years, the view appears to only be accelerating, with the use of various “personality assessments” increasingly on the rise in business, again predicated on the idea that personality traits are naturally fixed (and that therefore finding the “right” employee means finding the employee with the “right” pre-selected traits). Yet at the same time, research in psychology itself suggests a far different reality… that in practice, our actions and behaviors are heavily dictated by the context and situation that we’re in… which means that by changing our own situation, context, and environment, we can effectively change ourselves (and similarly, that businesses can create environments and contexts that help their people succeed regardless of their existing traits). Similarly, even trying to hire just based on someone’s cognitive ability can be deceptive, as the “plasticity” of our brains mean they can literally change and rewire themselves, growing larger (with better blood volume) with exercise and strengthening connections between neurons by “exercising” the brain with mental challenges. The key, though, is that improvement only occurs when there is change… which in turn requires either significant pain (to make us change) or extreme curiosity (to make us want to and be willing to). The starting point, though, is simply to understand that the decisions we make that shape our environment – from what we do, to whom we spend time with, and where – can actually shape us (and reshape our “traits”) over time. Which means making those decisions with intent, and being willing to go through change, can itself help us to create new positive “traits” (or overcome problem ones)! 5 Reasons Why Non-Digital Time Management Is More Productive (Tim Maurer) – While technological innovation and the conveniences it brings marches inevitably forward, there is a counter-movement afoot to return to the habits and processes of an older (and less digital) world. In part, this is simply driven by feelings of nostalgia, and experiencing things the way they once were. But Maurer suggests that voluntarily choosing more “analog” processes over digital convenience can actually enhance our productivity. A case-in-point is the Bullet Journal system, which was actually designed by a digital product designer named Ryder Carroll, but is a purely analog system (literally, a physical Journal book) used for “more mindful” task management. And why does a physical journal aid in mindful (and more productive) task management over today’s digital tools? Maurer suggests five core reasons: 1) Analog processes like a task journal literally take you away from the distractions of the computer (where the computer itself may help improve efficiency, but all the incoming emails, reminders, alerts, etc., are not! ); 2) It requires more effort, but that also literally requires you to be more mindful in what you’re doing in the tasks you set for yourself (i.e., it’s a “healthy” form of friction in the system); 3) the Bullet Journal approach is more of a framework than a system, making it easier to customize (and therefore feel more relevant for the individual); 4) It’s more enjoyable in allowing you to unplug (at least for a moment) and connect to what you’re doing and accomplishing; and 5) It works, especially for those who struggle with the rest of the distractions of modern technology and the temptation of (not-actually-feasible) multi-tasking. Investing In Yourself: Input/Output (Scott Bell, I Heart Wall Street) – One of the “challenges” of passive investing is that, for better or worse, you will get exactly what the market gives you; if you want a different result and outcome, you have to be more actively involved. Of course, when it comes to markets and investing, being more “active” doesn’t necessarily result in a better outcome, as markets themselves are fairly efficient. But the point of the metaphor is that when it comes to our personal lives, a similar phenomenon exists: if you simply passively go through life, you’re only going to get whatever it gives you, and if you want a materially different (and at least hopefully better!) outcome, you have to actively engage and do something. In Bell’s case, this led to a recent realization that he’s literally become too passive – i.e., a “desk jockey” – and so he made commitments to change (starting with eating healthier and drinking less). Yet change itself is incredibly difficult, often resulting in real physical pain or at least discomfort, and a test of willpower to stick to your convictions and desire for change against both temptations and peer pressure. The hardest part, though, is simply breaking old habits and forming new ones, an effort that requires you to literally “rewire” your brain for new habits. The good news, though, is that the brain itself is wired for “synaptic plasticity,” or the ability to rewire and change itself. Which is important, because it means that the willful exertion of effort to change habits can and does eventually rewire the brain to a new habit that won’t take as much effort to maintain in the future. Nonetheless, it makes you have to be proactive and thoughtful about the effort input you’re giving if you want to change and get a better (and sustained) output in the end!